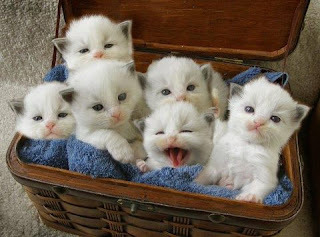 Kittens are always cute, but who can resist a picnic basket full of white fluffy kittens? They are so sweet. I like that they are white but their ears are kind of black or gray. Six cute kittens all tucked in, got to love it. Star Wars Halloween, Yoda as Poppa Smurf! Try working now with this kitty cat bookmark! Sir Kitty Cat on a Quest to slay the red dot!